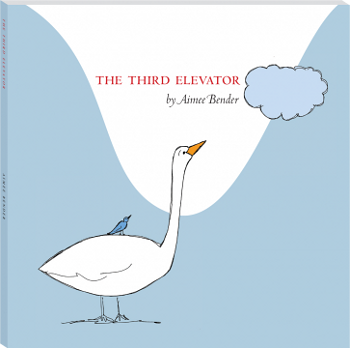 The Third Elevator , by Aimee Bender, is a new novella published by Madras Press. All proceeds from the sale of the novella benefit InsideOUT Writers. Publishing is never exactly an easy process—even after the difficulties of writing and editing are ended, there's the long process of printing and typing cover letters and mailing work away, only to set up the interminable wait after which, for most, a simple form letter or email finally arrives. Writers hear "no" at every turn, even more so if they're marketing work that fits outside normal genre boundaries. The traditional format of literary magazines isn't difficult to discern; this is the format that Strange Horizons, as well as countless other periodicals, follows—issues filled with short stories, poems, nonfiction, reviews. But what happens to pieces that defy traditional publishing rules? What about stories that are meant to be read alone, instead of acting as placeholders between ads and other, disparate pieces in magazines or collected books? Madrass Press was created by Sumanth Prabhaker to address the problem of finding suitable publishing opportunities for short fiction. "This is a very young project, inspired in part by some of my favorite publishing experiments—Concord Free Press, One Story, the old Penguin 60s series, the Penguin Great Ideas series, etc.," he writes. "Most people who read longer stories have done so either in a magazine, surrounded by editorial cartoons and advertisements and unrelated articles, or at the end of a short story collection. Neither of these are particularly desirable venues for a story that can take years to finish, and I think that's partially to blame for the relative obscurity of the in-between genre. It's unfortunate when writers view the thoughtless turns of commercial publishing as indicative of an inherent quality to something so basic as page length. Our job, as publishers, is to figure out suitable methods for making great literature available to large groups of people, regardless of what we're used to reading or to seeing on bookshelves." Madras Press is a small venture; currently, they boast a staff of one: Prabhaker. The books are printed in a plant in Montreal: "Manufacturing turns out to be the one thing it wouldn't have been responsible to try to take on from my living room." To keep costs down, Prabhaker has decided to forgo working with large commercial distributors, like Amazon.com or Barnes and Noble. Instead, you'll find Madras Press's offerings at independent bookstores scattered across the U.S., with a couple of locations in Canada, as well (books can also be purchased through Madras Press's website). Authors have also helped to keep prices down, by donating their work for no profit. Other than the cost of printing and website maintenance, almost everything at Madras Press is done on a voluntary basis. As Prabhaker explains, "We're doing our best to keep the sticker price low on our products, as our books are tiny, and tiny things tend to cost less." Besides being a publisher of the unpublishable, Madras Press has another function: that of a charitable organization. Each of Madras Press's authors chooses a charity to which the proceeds from the sales of their books are donated. For the first series of books, authors have chosen charities like Riverkeeper, an organization dedicated to preservation of the Hudson River and its tributaries and to keeping New York City's drinking water clean. Proceeds from the sale of Prabhaker's story benefit Helping Hands, which trains capuchin monkeys to act as live-in aids for individuals with spinal-cord injuries. Consider the math: each novella is printed in batches of one thousand; each book sells for between six to eight dollars. Depending on where consumers purchase the books—either through Madras Press's website or at a brick and mortar store—each novella can raise between two to five thousand dollars for its charity. 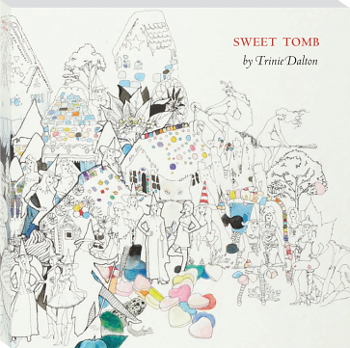 Trinie Dalton's Sweet Tomb tells the story of a candy-addicted witch named Candy. Proceeds from the sale of the book benefit the Theodore Payne Foundation. Cover art by Matt Greene. In their first series, Madras Press is offering a varied collection of novellas. There are fairy tales—Aimee Bender's The Third Elevator and Trinie Dalton's Sweet Tomb both fit this category—but they're definitely two different voices. Prabhaker describes Bender's story as "a fairy tale about a swan, a bluebird, their curious little family, the village they live in, and the things in their lives that move up and down." Dalton's book is a horse of another color: "a great, weird, campy story about a candy-addicted witch named Candy. Her gingerbread house in the forest burns down, and so she ventures out to the city in search of the excitement of a more urban lifestyle; along the way she meets up with a guy named ESP, the ghost of Pinocchio, and a banker named Death with an envy-inducing shoe collection." Prabhaker's story, A Mere Pittance , describes a telephone conversation between a young woman stranded in India and her lover, her boss, on the other side of the world. "As she relates to him the story of a metaphysical experience she endured, trapped beneath a fallen armoire in a strange hotel, their relationship becomes a creature all its own, beyond their control." The last offering from Madras Press is Bobcat , by Rebecca Lee. Prabhaker describes it as "a charming and meditative story about a dinner party in Manhattan. At just over thirty pages, this is our shortest title, but it's incredibly evocative and layered—there's a terrine before dinner and a trifle afterwards, and a pregnant person distributing chocolates and marzipan." Madras Press's second series of novellas is slated to go on sale after manufacturing costs for the first series have been recouped, projected to be sometime in the summer of 2010. More information about the press, as well as news updates and detailed summaries of its offerings, can be found on Madras Press's website: http://www.madraspress.com.